[6:08:37 PM] Thuan Thi Do: When the priest makes the three crosses with the Host over the Chalice, he wills strongly that the influence from the Monadic level should descend into the ego in itsthreefold manifestation of Âtma, Buddhi and Manas: and then, as he makes the two crosses between the Chalice and his own breast, he draws that influence into his own mental and astral bodies, that through him it may radiate fully upon his people. This symbolises the earlier stages of evolution, when the Monad hovers over his lower manifestations, brooding ( Page 308 )over them, acting upon them, but never touching them. So the priest holds the Host above the Chalice, yet never touches the one with the other until the appointed time has come. 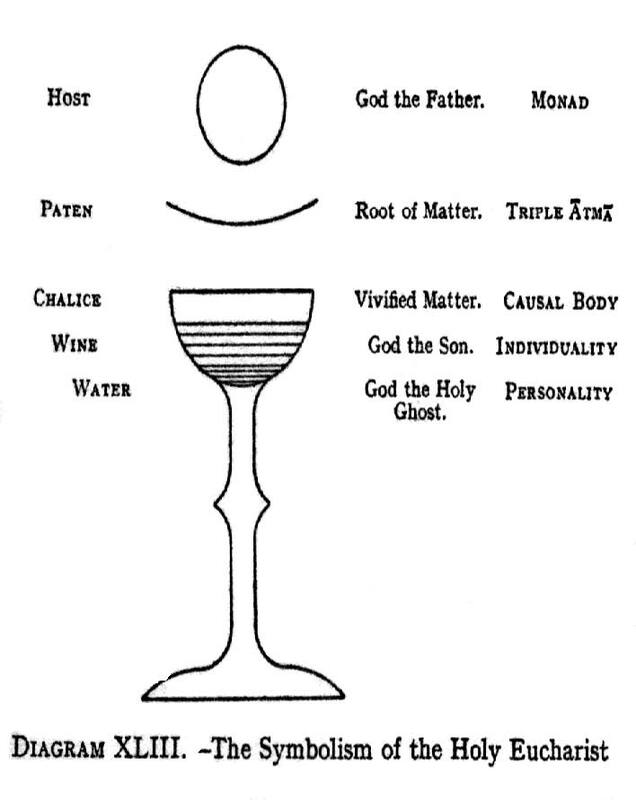 When the priest drops the fragment of the Host into the Chalice, he thereby signifies the descent of a ray of the Monad into the ego. To facilitate memorisation of this system of symbols, Diagram XLIII is appended. The first is its Maggo, or way, during which the student is striving to cast off the fetters. The Second is its Phala, literally fruit or result, when the man finds the result of his efforts showing themselves more and more. The Third is its Bhavagga, or consummation, the period when, the result having culminated, he is able to fulfil satisfactorily the work belonging to the step on which he now firmly stands. The Fourth is its Gotrabhu, which means the time when he has arrived at a fit state to receive the next Initiation. This means complete and entire freedom from the fetters of his stage on the Path. The first of the three fetters, or Samyojana, which have to be cast off, before the candidate can take the Second Initiation, is Sakkayaditthi, the delusion of self. This is the "I - am - I " consciousness which, as connected with the personality, is nothing but an illusion, and must be got rid of at the very first step of the real upward Path. But to cast off the fetter completely means even more than this, for it involves the realisation of the fact that the individuality also is, in very truth, one with the All, that it can therefore never have any interests opposed to those of its brethren, and that it is most truly progressing when it most assists the progress of others. The second fetter is Vichikichcha, doubt or uncertainty. The candidate must arrive at the certainty of conviction, founded on individual experiment, or mathematical reasoning. He believes, not ( Page 310 ) because he has been told, but because facts are now self-evident. This is the only method of resolving doubt known to occultism. The third fetter is Silabbataparamasa, or superstition. This includes all kinds of unreasoning and mistaken belief, and all dependence upon outward rites and ceremonies to purify the heart. The man must realise that within himself deliverance must be sought, and that, however valuable aids such as ceremonies, etc., may be in developing will, wisdom and love, yet they can never take the place of that personal effort by which alone he can achieve. The knowledge of the spiritual permanence of the true ego brings reliance on one's own spiritual strength, and so dispels superstition. The buddhic consciousness is directly related to these three fetters, for they are all dispelled by that consciousness. Recognising the unity, the man can have no delusion of separateness. Seeing for himself the great laws of life in operation, he can no longer doubt. He sees all the roads that lead to the one Bliss, and that all roads are good, so that he can no longer hold to the superstition that any one form of belief is necessary, to one who has attained that level. The Second Initiation takes place in the lower mental world, so that the candidate must have developed the power to function freely in his mental body. This Initiation rapidly continues the development of the mental body, and at or near this point the pupil learns to use the mayavirupa [vide The Mental Body, p. 169] . At the Second Initiation, the Key of Knowledge is given, the Initiator pouring out, from His own mental and causal bodies, rays of power which, falling on the mental and causal bodies of the Initiate, stimulate into sudden and splendid growth, the germs of similar powers therein existing. As though a bud, stimulated by the sun-rays, should suddenly burst into all the glory of the opened flower, so do the mental and causal bodies suddenly unfold the powers latent within them, ( Page 311 ) expanding into radiant beauty. Through them, now expanded, buddhi or intuition can play freely, the great new power being thus set free to work. The period after the Second Initiation is in many ways the most dangerous anywhere on the Path : it is at this stage that, if there is any weakness in a candidate's character, it will find him out. In nearly all cases, the danger comes through pride. It is indicated in the Gospel story by the temptation in the wilderness. As the First Initiation corresponds to a new birth, so may the Second Initiation, be compared to the baptism of the Holy Ghost and Fire, for it is the power of the Third Person of the Trinity that is outpoured at that moment, in what may but inadequately be described as a flood of fire. The man at this stage is known to the Buddhists as a Sakadagamin,the man who returns but once, the meaning being that he should need but one more incarnation before attaining Arhatship, the Fourth Initiation. The Hindu name for this step is the Kitichaka, the man who builds a hut, he who builds a hut, he who has reached a place of peace. At this stage no additional fetters are cast off, but it is usually a period of considerable psychic and intellectual advancement. The man must have the astral consciousness at his command during physical waking life, and, during sleep, the heaven-world will be open before him. When the Third Initiation is passed, the man becomes the Anagamin, which means literally, "he who does not return", for it is expected of him that he will attain the next Initiation in the same incarnation. The Hindu name for this stage is the Hamsa, which means a swan, but the word is also considered to be a form of the sentence So-Ham , "That am I ". There is a tradition, too, that the swan is able to separate milk from water, and the Sage is similarly able to realise the true value, for living beings, of the phenomenon of life. This Initiation is typified, in the Christian symbolism, ( Page 312 ) by the Transfiguration of the Christ. He went up into a high mountain apart, and was transfigured before His disciples : "his face did shine as the sun, and his raiment was white as the light", exceeding white as snow, so as no fuller on earth can white them". This description suggests the Augoeides, the glorified man, and it is an accurate picture of what happens at this Initiation, for, just as the Second Initiation is principally concerned with the quickening of the lower mental body, so at this stage the causal body is especially developed. The ego is brought more closely into touch with the Monad, and is thus transfigured in very truth. Even the personality is affected by that wondrous outpouring. The higher and the lower self became one at the First Initiation, and that unity is never lost but the development of the higher self, that now takes place, can never be measured in the lower worlds of form, although the two are one to the greatest, possible extent. At this stage, the man is brought before the Spiritual King of the World, the Head of the Occult Hierarchy, Who, at this step, either confers the initiation Himself , or deputes one of His Pupils, the three Lords of the Flame, to do so. In the latter event, the man is presented to the king soon after the Initiation has taken place..
[6:10:11 PM] Thuan Thi Do: Thus the "Christ" is brought into the presence of His "Father" ; the buddhi in the Initiate is raised, until it becomes one with its origin on the nirvanic plane, and a very wonderful union between the first and second principles in man is thus effected. The Anagamin enjoys, while moving through the round of his daily work, all the splendid possibilities given by full possession of the faculties of the higher mental plane, and during the sleep of the body, he enters the buddhic plane. In this stage, he has to throw off any lingering remains of the fourth and fifth fetters- attachment to the enjoyment of sensation, typified by earthly love, and all possibility of anger or hatred. He must become free from the possibility of being enslaved in ( Page 313 ) any way by external things. He must rise above all considerations connected with the mere personality of those around him, recognising that the affection which flourishes upon the Path is an affection between egos. Therefore it is strong and permanent, without fear of diminution or fluctuation, for it is that "perfect love which casteth out fear". The Fourth Initiation is known as that of the Arhat, which means the worthy, the capable, the venerable or perfect. The Hindus call the Arhat the Paramahamsa, the one above and beyond the Hamsa. In the Christian system the Fourth Initiation is indicated by the suffering in the Garden of Gethsemane, the Crucifixion and the Resurrection of the Christ. This Initiation differs from the others in that it has the double aspect of suffering, and victory, hence a series of events has been employed to represent it. The type of suffering, which accompanies the Initiation, clears off any arrears of karma which may still stand in the Initiate's way. The patience and joyousness, with which he endures them, have great value in the strengthening, of his character, and help to determine the extent of his usefulness in the work which lies before him. that he may learn to stand cut off from everything external, and test and realise his own utter certainty that he is one with the Logos, and that any such feeling of loneliness must be but an illusion. Avichi for the black magician corresponds to nirvana for the White Adept. Both of these types of men, antithesis of each other, are yogis, and each gets the ( Page 314 ) result of the law he has followed. One attains the kaivalyam - realisation of oneness, complete isolation - of Avichi, the other the kaivalyam of Nirvana. For the Arhat, while still in the physical body, the consciousness of the buddhic plane is his, this being its normal home. In fact, to stand at the level of the Arhat involves the power fully to use the buddhic vehicle. When the Arhat draws himself up into the buddhic plane, it must not be supposed that manas is in any way lost. For he draws up manas with him into that expression of manas which has all the time existed on the buddhic plane but has not been fully vivified until now. He still remains triple, but instead of being on the three planes, he is now on two, with atma developed on its own plane , buddhi on its own plane, and manas level with buddhi, drawn up into the intuition. Then he discards the causal body, because he has no further need of it. When he wishes to come down again, and manifest on the mental plane, he has to make a new causal body, but otherwise he does not need one. Much in the same way, at a later stage, the buddhi and the glorified intellect will be drawn up into the atmic plane, and the triple spirit will be fully vivified. Then the three manifestations will converge into one. That is a power within the reach of the Adept, because, as we shall see in due course, He unifies the Monad and the ego, just as the disciple is trying to unite the ego with the personality. This drawing up of the higher manas from the causal body, so that it is on the buddhic plane side by side with the buddhi, is the aspect or condition of the ego which H.P.Blavatsky called the spiritual ego, which is buddhi plus the manasic aspect of the One, which was drawn up into buddhi when the causal vehicle was cast aside. That state - that of the Arhat—is called by Christian mystics that of spiritual illumination, of the Christ in man. Manas –taijasi, the resplendent or illuminated manas, which is really buddhi, or at least that state of man when his manas has become merged in buddhi, having no separate will of its own. Manas proper, the higher manas, the abstract thinking mind. Antahkarana, the link of channel or bridge between the higher manas and kama manas during incarnation. Kama-manas which, on this theory, is the personality. When the Arhat leaves the physical body in sleep or trance, he passes at once into the unutterable glory of the nirvanic plane. His daily effort is now to reach further and further up into the nirvanic plane, up the five lower sub-planes on which the human ego has being. He has a number of planes open to him, and can focus his consciousness at any particular level he chooses, although there will always be a background of the buddhic and nirvanic consciousness. Even at the atmic level, there is a sheath of some sort for the Spirit, for in one sense it seems as though it were an atom, and yet in another it seems to be the whole plane. The man feels as if he were everywhere, but could focus anywhere within himself, and wherever for a moment the outpouring of force diminishes, that is for him a body. Ruparaga—desire for beauty of form, or for physical existence in a form, even including that in the heaven world. Aruparaga - desire for formless life. Uddhachcha - agitation or irritability, the possibility of being disturbed by anything. The Arhat Initiation may be thought of as a halfway between the First and the Fifth Initiations. On the first half of the Path - from the First to the ( Page 316 ) Fourth Initiation—the man is busy shaking himself free from those personal limitations, from the illusion of "it". On the second half, he is engaged in releasing himself from the illusion of "you". It is usually said that seven lives are occupied, in the average case, at normal times, between the First and Fourth Initiations, and seven lives also between the Fourth and Fifth. But these figures are capable of very great reduction or increase. In most cases the actual period is not very great, since usually the lives are taken in immediate succession, without interludes in the heaven world. [7:23:34 PM | Removed 7:24:23 PM] huyen dong: This message has been removed.